Cycling in Beijing can be maddening. Selfish drivers, particularly those who drive or, even worse, park in cycling lanes, are near to the top of my list of pet hates. The more expensive the lump of metal in the lane, the more it grates. So imagine my blood-pressure reading yesterday when I spotted a Rolls-Royce being unloaded in my lane. My seething was soothed, however, as soon as I began to take in just how beautiful the car was. My gut reaction of "selfish", "inconsiderate", "thoughtless", was replaced by a different set of descriptors that included "distinguished", "elegant", "superbly-crafted", and "quintesentially-British". Cynics may claim that the car is, these days, more German than British. "Complete tosh," I say. Yes, the brand and company are owned by BMW. Yes, the engines are made in Germany not "back home" in Goodwood, West Sussex. And yes Torsten Müller-Ötvös, the CEO, was born in Düsseldorf not in Dorking. But those German links do not detract from its Britishness, which is ingrained in the brand's soul. On the contrary, BMW brings much to the party, not least its skills of building cars and managing brands. Mr Müller-Ötvös has an impressive track record of revitalising flagging iconic British automotive brands. As vice-president of brand strategy and product management for Mini from 2000-2003, he oversaw the global relaunch that propelled the brand towards the dizzying heights of popularity it enjoys today. In 2011, in the first full-year of his stewardship of Rolls-Royce, the company achieved an all-time sales record of 3,538 cars – more that 30 per cent more than in 2010, and more than 400 per cent more than in 2005 (when only 796 cars were sold). 2011 was also a significant year in Rolls-Royce's history in that China overtook the US to become the company's biggest market. Last year, more than 1000 Rollers were sold in China. The Beijing dealership – outside which I took the attached photos – was the company's most successful. Not coincidentally, there are more "super-rich" people in Beijing than in any other city in China. 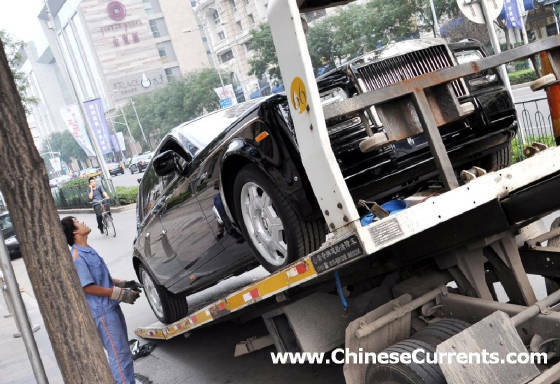 According to the 2012 edition of the Hurun report, which monitors such things, there are 10,500 people here who meet the "super-rich" requirement of 100 million yuan or more in assets. There are also more RMB-billionaires in Beijing than anywhere else (830 of them according to Hurun). There are Rolls-Royce dealerships in 12 Chinese cities with 4 more "opening soon" in other cities, according to the company's website. Not surprisingly, the vast majority of China's super-rich are residents of these 16 cities. China-sales are so important to Rolls-Royce that the global launch of the extended-wheelbase Phantom (series II) was, in spring this year, held in Beijing. Perhaps more surprisingly, Rolls-Royce also launched a China-bespoke model, the Year of the Dragon special edition, which sold out within a few weeks of its launch (thanks to its theme of Britishness with Chinese characteristics perhaps). The Rolls-Royce Phantom was voted "Best Super Luxury Car For Business" in the Hurun best of the best survey 2012. Winners of other categories were Patek Philippe (watch); Cartier (jewellery); Giorgio Armani (men's fashion); Chanel (women's fashion); Louis XIII (luxury drink); and Montblanc (pen). Talking of which, a pen-picture of the Rolls-Royce owner in China reveals that he (the vast majority are indeed men) is, according to Mr Müller-Ötvös (interviewed by The Telegraph), between 30 and 40 years old, has more than likely studied abroad, and runs his own business. As far as the Chinese owners of Rolls-Royce are concerned, Britishness, it seems, equates to superb craftsmanship. Mr Müller-Ötvös told The Telegraph that, "It takes over 400 hours to produce a Rolls Royce. This is exactly what Chinese customers also love... this attention to detail, precision, hand-crafting which is also very much in the history of China... The fact that the car has character. You can almost feel its soul. That is not the case with cars made elsewhere. It’s about the way how we treat leather, how we make stitches, those small details that requires time to be made and therefore they’re not cheap. That is why we can produce max five cars per day". The focus on detail also extends to the sales consultant at the Beijing dealership, who studied every move that the delivery-man made as he unloaded the car from the trailor. Word-of-mouth (that eulogises the brand and its service standards) heavily influences the decision-making process. Who do the richest people in China look to for advice on how to spend their money? People whose opinions they trust, of course. Who tend to be people who know a lot about luxury brands... not just about how much they cost, but why they cost so much. They are influenced by people who appreciate the culture and heritage of the brand, who can tell the stories that bring a brand to life, who can recognise outstanding quality when they see, hear, touch, smell, or taste it. They are also influenced, in a very different way, by people who can do none of those things. And by people who, for example, demand that their baby photo be engineered into their Roller's interior fibre optic "Starlight Headliner" (a roof lining that gives the impression of a "starry night sky" apparently). Now that there are thousands of Rolls-Royce owners in China (all of whom bought their cars later than 2002), advocates of the brand have reached critical mass. 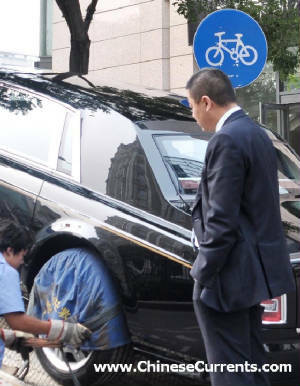 And, given that the super-rich in China are supremely well-connected, it is quite likely that someone who has the means to buy a Rolls-Royce actually knows a Rolls-Royce owner. The owner's personality, demeanour, and perceived sophistication therefore, are increasingly likely to be a greater influence on a would-be purchaser than any other exposure to the brand. The sales consultant with a meticulous eye for detail, I watched taking delivery of the extended-wheelbase Phantom (Series II), will of course continue to act as a brand ambassador. But his role is being usurped to a large extent by the brand ambassadors behind the darkened glass of their Phantoms and Ghosts. I was thinking of sounding out my hypothesis with the smart-suited sales consultant. Then I suddenly remembered that I was riding a bike (and not the Rolls-Royce of bikes I have to say). I also had 30km of road-dirt plastered to various bits of my anatomy. So, not wanting to sully his idea of Britishness, I instead snapped a few shots that appear here, before squeezing past and continuing very un-phantom-like down the cycle lane. This is an edited version of an article that was written in September 2012.